We have noticed that some of you are still looking for key informant interviewees. The key informant interviews were scheduled to be presented last week (please see the syllabus). This assignment must be completed for tomorrow, this means transcribed and represented in a visual format (for the gazette). The opinion surveys were scheduled for this week but since you are behind, we’ll discuss tomorrow when is the deadline. We are expecting to review tomorrow the progress of your research, especially the visual representation, maps, diagrams, drawings, etc. Please prepare a pdf or power point to present in the big screen the work you are going to include in the gazette, including the interview. We are going to review group by group. Each group will have one hour, so please prepare your work (aprox 6 minutes). We haven’t seen the progress of all the students. Tomorrow is the last class before the Mid-term review. As per a conversation with Bonnie and other members of our group, we find that this presentation is too far-reaching in this little time we have since given first notice of this radical shift in class plans for tomorrow. Most of us currently have Theory Lab in over two hours, and I know for a fact Bonnie is currently working on a presentation. I know this is nowhere to say something is impossible; but, it will be quite difficult to conceive of a presentation in the hours after Theory Lab considering how hard schedules have been to coordinate on such a whim with people’s classes, work-commitments, and family-commitments. Granted, while I understand that we have been behind on the assignments according to the syllabus, more time should have been given notice to us to prepare for this kind of presentation. Since our group meeting yesterday afternoon into night, we expected to have group meetings with you and Frank tomorrow to discuss how we should plan our presentation for next week, and collaborate on our data and progress to find what needs to be illustrated in the midterm review and additional info that is not needed at the current moment. In my personal situation on the interviews, I have found it troubling to get an interview with people when you are reaching out with a cold-email; alas, that is where my fault lies. I have sent you and Frank an email earlier today detailing this critical issue; and, pondering how to rectify this matter. I realize I should have emailed earlier; but, I’ve been having trouble with my inbox as of the past two weeks. In the meantime, I have found another interview that should be able to be set up within the next two-three weeks that would be quite fruitful for our course endeavors as a whole. 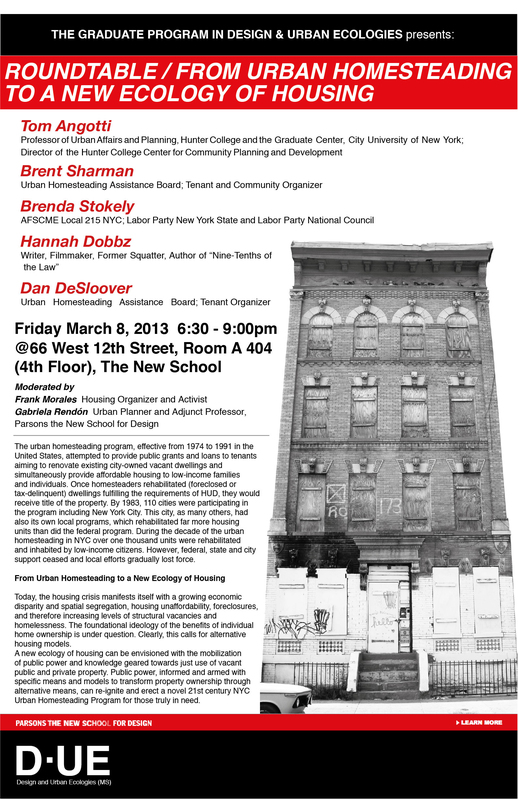 As a personal aside, I feel the need that we MUST discuss the actual foundations and principles of ‘Urban Homesteading’ as I feel that there is much in question considering the state of New York City. As I have read through the standings of the program from the 80’s via the Furman Center and UHAB, I still don’t feel that this program will solve much of anything in this current economic climate. It’s not that I do not believe in this program; but, we need securities to ensure that this becomes a program usable by those who NEED it. I am playing the Devil’s Advocate; because, much of the inner-workings of the program must be fleshed out to prevent it from becoming a “Yuppie Manifest Destiny”: the allowance of gentry to essentially get right of way to displace and build their own home further exacerbating the current crisis. This homesteading plan cannot be the ends of this studio; but, a means to ending displacement, inequality, exploitation, etc.. I voiced this concern last week; but, with fumbled language. As my research continued, I do not see how we can continue producing visuals for a program we have yet to fully establish as a whole. UNLESS… These comments that I am addressing are in both Phase II and III of this studio; and, I am already going three steps ahead of where Phase I.
Charles, please take a look to the syllabus (the different phases) and the text that Frank circulated during the first week. I thought we were very clear since the very beginning, the aim is to re-envision a program that could be feasible and that could serve very low income households. We can discuss this tomorrow. Thank you for the clarification, I’ve been doing just that. I’ve been brainstorming extra components for the program that would be helpful to ensuring the survival of the program; but, it’s continued use by those who need it. I will introduce some ideas in the presentation PDF. Charles, just remember that we are going to start envisioning the new approach in the second phase. The research phase is to expose the past and current condition on housing, homelessness, vacancy and the urban homesteading program. The plan is the same, to review your research progress and interviews. I’m only asking you to put everything together in a pdf since it is easier to visualize the information this way (big screen). I think a six-minute presentation would take only 15 minutes to put together if you have everything ready to go. The other option would be to print, but it would take more time. It won’t be a class review but a group review in large scale.